Rugged chore-busters to take on the rough stuff! Up ladders, across girders, over the field and through the stream you go, day in day out... your footwear's gotta be right there with you, keeping you comfortable and protected through it all. Why not lace up in classic Carolina® quality? With a 100% water-blocking membrane and comfort layers to keep your dogs happy, they're a favorite of hard-working sorts everywhere. 6" h., each approx. 26 ozs. (Composite Toe). State Size and Width, as available in the Shopping Cart. Take advantage of classic Carolina quality at a great price... order ONLINE now! 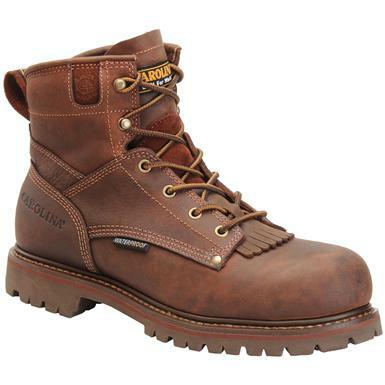 Mens Carolina 6 Waterproof Composite Toe Boots is rated 5.0 out of 5 by 2.